Mark Hoban, a board member at financial services body TheCityUK, confirmed to Sky News that the delegation went as part of a "regular series of trips" to talk about the post-divorce scenario. The existence of the delegation is sensitive because it appears to sidestep the Government's own negotiating efforts by going directly to the EU, even while reportedly having the tacit support of senior figures in Whitehall. It is arguing for continued mutual access between Britain - Europe's major global financial centre - and the remaining 27 EU countries after Britain leaves. But the EU's chief Brexit negotiator Michel Barnier is warning that the prospect of "frictionless trade" after Brexit is not possible. Mr Hoban, who is a former City minister, told Sky News: "We want to minimise the disruption caused to European businesses and households by losing access to the sorts of services that are concentrated here in the City." He said the City wanted a "strong, open relationship", acknowledging that it would be outside the single market, but with "high levels of access". "It will actually be a cost to them if we leave the EU and they have no access to the services in London," he said. But Mr Hoban the system being called for is not a narrow "equivalence" arrangement with the EU that would simply see the UK becoming "a rule taker not a rule maker". 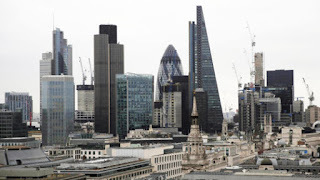 His comments come as a report from TheCityUK warns that Britain could lose its status as Europe's top financial centre unless it keeps its borders open to specialist staff. "Shifts out of the UK may gradually erode the 'cluster effect' of the financial ecosystem, with the threat of a tipping point in the ecosystem being reached," the report said.